Click the button below to add the U-Marq GEM-RX4 Jewelry Engraving Machine to your wish list. UMarq's GEM-RX4 jewelry engraving machine is the fastest and most versatile engraver of its size on the market. The UMarq GEM-RX4 computerized engraving machine is the result of years of feedback from Jewelers and retail engravers around the world. With the UMarq GEM-RX4 jewelry engraving machine’s 170mm x 60mm flat engraving area, self centering vise, and 70mm (with bangle attachment) cylindrical engraving diameter, the UMarq GEM-RX4 jewelry engraving machine will meet the needs of Jewelers and retail engravers alike. The UMarq GEM-RX4 jewelry engraving machine’s self centering vise and rotating spindle will make light work of pet tags, gently curved jewelry, gift items, lighters, small metal, plastic tags, and award plates. Not only will the UMarq GEM-RX4 jewelry engraving machine make production quick and easy of flat and gently curved items, but the UMarq GEM-RX4 computerized engraver will increase profitability due to its ease of use and compact size. Want to engrave the inside of a ring? Want to engrave on a pen? Well, the UMarq GEM-RX4 jewelry engraving machine will meet these tasks with ease. The UMarq GEM-RX4 computerized jewelry engraving machine has a fully controllable integrated 4th cylindrical axis, which means engraving small cylindrical items like bangle bracelets, pens, and the inside and outside of rings is as easy as engraving flat items. 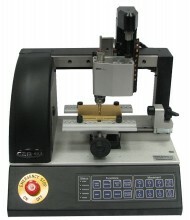 The compact size of the UMarq GEM-RX4 jewelry engraving machine (13.4” x 10.8” x 9.4”), will fit into any size business. It doesn’t matter if you are running a jewelry kiosk in a mall or own your own Jewelry store, space is a commodity. The UMarq GEM-RX4 computerized engraver has a small footprint and since it can easily engrave on flat or cylindrical items, it eliminates the need for having two separate machines. The UMarq GEM-RX4 jewelry engraving machine is a compact professional engraver that will make a profitable addition to any business. USB to RS232 converter cable, power cable, serial cable, usb to serial converter, 120°diamond drag, carbide cutter, cutter knob, vernier nose cone, light touch, standard aluminum jigs, jig pins, 20 fonts, cylindrical pen attachments, UMARQ-GEM-RX4 engraving software package and quick start guide.